Richmond International Airport, VA (January 29, 2019 ) – Richmond International Airport (RIC) reports a new annual traffic record as more than four million passengers flew in and out of the Airport in 2018. With every month setting a record along the way, the 2018 total of 4,077,763 passengers represents an 11.5 percent increase over the previous standard (3,657,479) set just a year ago. In December, passenger traffic increased 16.0 percent to 338,879, a new December record. Delta Air Lines was the market share leader during the month with a 30.4 share, followed by American and United. New-entrant Spirit claimed a 4.9 percent share. All incumbent airlines reported growth in December, including United (+13.4%), American (+12.7%), Delta (+8.4%), JetBlue (+7.7%), and Southwest (+4.0%). Allegiant, with twice-weekly service to three destinations, reported an increase of more than 24 percent. View RIC’s monthly summary here: https://flyrichmond.com/airport-information/#monthly-statistics. Total cargo, measured as a sum of freight and mail, decreased 6.5 percent in December, but reported an annual increase of 3.7 percent to surpass 140 million pounds in 2018. 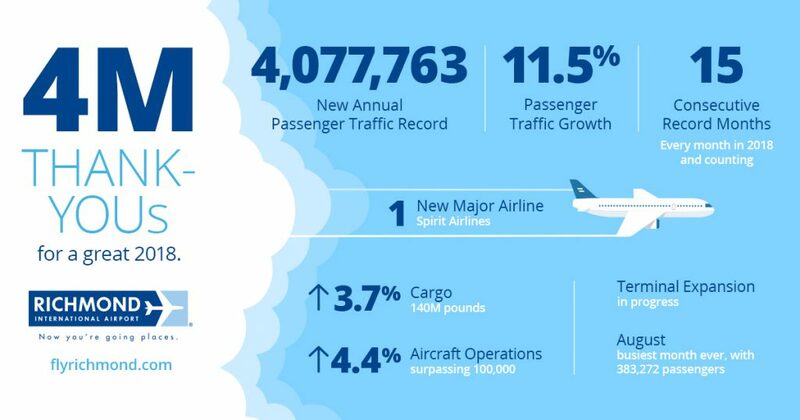 Likewise, aircraft operations decreased 5.4 percent versus the same month a year ago, but increased 4.4 percent for the year to more than 100,000 annual operations. Through December, the midpoint of the Commission’s fiscal year, operating revenues totaled $26.3 million, greater than budget by $2.8 million (12%). For the same period, operating expenses amounted to $13.0 million, less than budget by $56 thousand (less than 1%). The 11.5” snowstorm of December 9-10, 2018, caused approximately 150 passenger flight cancellations. The monthly total of 186 cancellations was the highest December count since 2010. Allegiant is on track to start new twice-weekly service to Sarasota-Bradenton International Airport (SRQ) on April 4th. SRQ will be Allegiant’s fourth destination from Richmond, joining St. Pete/Clearwater (PIE), Orlando/Sanford (SFB), and Nashville (BNA). Starting in April, United Airlines will add a sixth daily frequency on the Richmond-Newark (EWR) route, increasing scheduled weekly RIC-EWR seats by 23 percent. Scheduled seat capacity by airlines operating at RIC shows increases of double-digit percentages through at least April. Billy Moore, an employee with the Airport’s Auto/Equipment Maintenance department, was recognized by the Commission for 20 years of service. Additionally, the Commission presented skycap Johnie Freeman with a Navigator Award for more than 30 years of outstanding service to Airport customers. A two-year lease agreement with Henrico Volunteer Rescue Squad for an existing facility and surrounding land was approved by the Commission. Richmond International Airport (RIC) is one of the most modern airports in the eastern U.S. Seven major airlines, Allegiant, American, Delta, JetBlue, Southwest, Spirit, and United, offer nonstop flights to major domestic destinations and connecting options to points around the world. The activities of RIC and its tenants create nearly 16,000 jobs and contribute $2.1 billion in economic activity annually to the Richmond region, per the Virginia Department of Aviation. To learn more, please visit flyrichmond.com.